The setting for this scene is in Brittany, which is a peninsula in northwestern France. Brittany has more good harbors than any other part of France. According to legend it was one of the lands of King Arthur. Because of all the coast line, many people made their living by fishing. 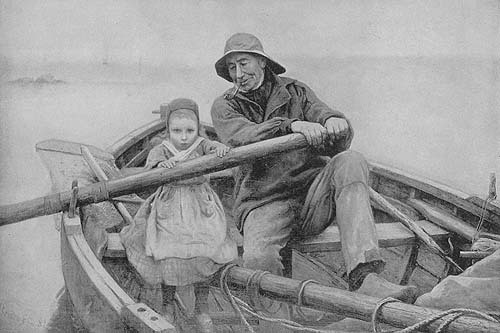 Here we see a fisherman, a grandfather, who is out fishing with his granddaughter. Maybe she begged to go fishing with Grandfather. She thinks that she is really helping him row the boat. See how hard she is concentrating on the job. Grandfather, contentedly smoking his pipe, looks at her fondly. He knows that the small strength she has in her arms isn't really much help in rowing the boat. She mainly helps him by her devotion to him, her grandfather. We don't see any fish in the picture. Maybe they have just started out for the day. Look at how her pockets are bulging. What do you think she is carrying in those pockets?